You are here: Home / Advertising / Will California’s New Menu Labeling Help Kids’ Health? Wait a sec, didn’t we already approve this? I gave it 200% support long ago when it was first introduced! Feels like that Padilla/Migden bill has been floating around for an eternity. SB 1420’s co-sponsors California Center for Public Health Advocacy and the American Cancer Society (who just announced Lance Armstrong is back in the saddle, to do a Global Cancer Summit, btw!) should feel VERY proud of this progress! As I recall before this ‘compromise,’ the bill was tougher, requiring restaurants with 14+ locations to list the nutrition content (e.g. 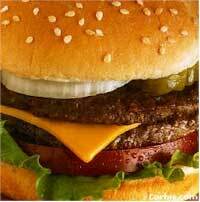 calories, saturated fat, trans fat, carbohydrates and sodium) for each regular item directly on their menus. 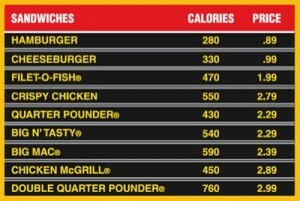 Now, it’s “up” to 20 eateries, and “down” to just listing calories alone. Yeah, yeah I understand all the info won’t all fit on a menu board, but the FULL nutritional info (NOT just the calorie count) should be AVAILABLE at the very least upon inquiry at these big chains. I do most of my nutrition research online anyway, but it defeats the purpose if the consumer is in purchase mode and can’t get the info they need to make a healthy choice. Hunches (hmn, oatmeal over the bran muffin?) can only go so far when most of these eateries pack a wallop of sugar and sat fat in EVERYthing…even stuff that SOUNDS healthy. 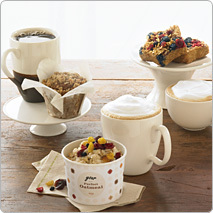 For the record, Starbucks’ “Perfect Oatmeal” ranges from 140 to 390 calories depending on 3 topping selections…It can be customized with: a 50-calorie pack of brown sugar, 100-calorie pack of dried fruit, or 100-calorie pack of a nut medley. Personally, if I had allergies or health issues requiring me to watch key ingredients like sodium, sugar, sat fats or cholesterol (oh, wait, I do!) then I’d like some sort of uniform visual icon that cues me to a nationally recognized set of benchmarks that indicate what is IN the food I’m eating, rather than play hide and seek to unravel the marketing spin at EACH restaurant. Then again, I don’t eat at those places often anyway, so I guess I’m not the target market. At least a ‘calorie’ snapshot will dissuade anyone inclined to ‘eat healthier’ to order a different item at these franchises, but chains like this are not exactly hubs for wellness to begin with, so I’m not sure what kind of an impact this will have on the childhood obesity issue overall. It’s certainly no silver bullet. But it’s a start for awareness building. “The idea, they say, is that restaurant-goers might not be inclined to order that bloomin’ onion if they realize it packs a whopping 2275 calories, more than the average adult needs to eat in one day. And there is some research to back that up. A study in New York City after the law went into effect showed that 12% of Subway customers reported seeing the information and changing their orders accordingly, ordering meals with 99 fewer calories than diners who saw the information but weren’t affected. Today’s skyrocketing rates of obesity result from a combination of factors like a more sedentary lifestyle, larger portions, a reliance on processed foods and more meals eaten out than in previous generations. Kids who eat low-calorie meals at McDonalds and then go home to play Wii for six hours still won’t be healthy. And parents who make fast food meals a regular part of the family diet may not be the adults most concerned with childhood nutrition in the first place. Still, money talks, and consumers can take a stand with that clout. I fully support Subway Sandwiches’ nutritional transparency, for example, so that’s my ‘fast food of choice.’ They spell it out. Make it easy. And offer options on all sides of the fast food wellness sphere. So they get my business. Ditch the spin. Be honest with nutrition facts. Is that so hard? Nine other states have considered similar menu labeling legislation this session, although none have made it as far as California…The other states include Hawaii (HB 54), Illinois (HB 389), Iowa (SF 2158), Massachusetts (SB 1290), Michigan (HB 4791), New York (AB 729), Tennessee (SB 1696), Vermont (HB 477), and Washington (HB 3160). But I ask you…why can’t we just get ONE national policy in place to work with, as CSPI has been requesting for years? The FDA label lingo requires certain phrases and claims (fat free, low-fat, etc.) to meet a certain set of standard-based criteria…why not simply match ‘em up with a little visual icon for universal ‘at a glance’ ease of use, on menus, packaging, the works. The U.K. Food Standards Agency seems to have a pretty straightforward start…and the little ‘dots’ are easy to comprehend from womb to tomb on the age-group visibility scale. In the U.S. though, we’re always putting profit before public health, so you practically have to be a registered dietician to discern labels and claims, even with visual help like this! Regardless of semantics, one set of standards is common sense so we can all KNOW what we’re putting in our bodies as we try to steer clear of chem cuisine. Here’s a cute little video of kids’ enacting the ease of listing calories on fast food menus using Barbie dolls. It’s sourced from MenuLabeling.org which houses all of CSPI’s latest and greatest developments along these lines…like today’s announcement that Yum Brands (KFC, Pizza Hut, Taco Bell, and Long John Silver’s) will follow California’s lead. Woohoo! Okay tech team, could someone please advise me how to prevent links like the one above from snagging content and redirecting to their horrid body dysmorphia buffed boy wanna be site? Thanks, bloggers, for any help/advice you can offer. We were involved in the California Center for Public Health Advocacy’s efforts to get SB 1420 passed and I just want to clarify a point you made in your blog posting (which I pulled out above). 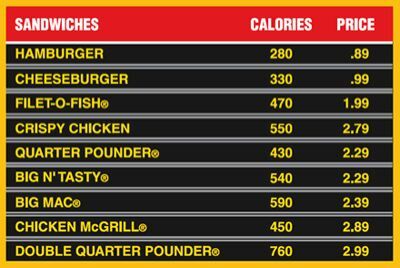 In addition to posting calorie information on menu boards by 2011, restaurant chains will be REQUIRED to make brochures with nutrition information available in their restaurants. No longer will you have to deal with cashiers fumbling in the back in search of that brochure (the exact same thing happened to me at Starbuck’s), it’ll be right next to the cash register!! Thanks for calling attention to this important public health victory! Thank YOU for helping clarify…yep, I KNOW they SHOULD be available, but they’re not (yet) so like I said in the post, SB1420 should definitely help there! Drat, I wish we didn’t have to wait until 2011…I just got my cholesterol screening back and my hereditary/stress level etc. has put me in a ‘danger’ zone…so one can never know by ‘appearance’ who has what health issue and NEEDS to know that nutrition info!!! Um, yeah…I sure do. sigh. And much, much more!!! Check ’em out. Looks like we just found more ‘good guys’ in the media/marketing/PR industry. woohoo! Can kids read? What ages read? Can they understand math to be able to add calories? Seems from what I have heard…most kids can’t read and wouldn’t benefit from the new menu labeling. Am I wrong? Seems what you’re REALLY getting at here, Bill, is the question of whether menu labeling will ‘do anything’ in terms of curbing obesity, and whether we’re just cluttering up our consciousness with more regulatory crud. HOWEVER, that’s the premise behind some of Shaping Youth’s deconstruction of junk food in our Dare to Compare/Gross Out Game for Good Nutrition, and as you know, it works wonders. When kids visually SEE the salt, sugar, etc. broken out into fun games, they begin to look at their food in new ways. I’ll never forget how ‘label literate’ that high risk crowd of 4th/5th graders became, as they’d call out to me the ingredients from the backs of their district lunch chocolate milk cartons, and processed ‘graham’ cookies and such. Kids are smart. Very smart. 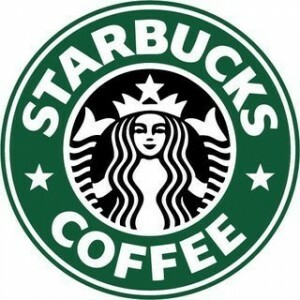 And teens and adults are of course a target market for this too…Sucking down Frapuccinos is no way to get your calcium when these kids suddenly SEE they’re ingesting most of their days’ DV of sat fat in one ‘shake-like’ slurp! Kids not only ‘read’ they are being pushed into kindergarten classrooms with sophisticated ‘breakout levels’ for diff. literacy acumen. Math-wise, there’s not much in the way of ‘adding up calories’ that’s required, a quick glance tells you ‘less or more’ and if someone’s inclined to be health conscious, could help determine a choice. I was thrilled to see my own ‘fast food choice’ Subway was the ‘best of show’…yay. Doin’ somethin’ right! “Subway’s kids’ meals came out on top. Only a third of its Fresh Fit for Kids meals, which include a mini-sub, juice box, and one of several healthful side items (apple slices, raisins, or yogurt), exceed the 430-calorie threshold. Subway is the only chain that doesn’t offer soft drinks with kids’ meals. “Besides being almost always too high in calories, 45 percent of the kids’ meals at the 13 chains studied by CSPI are too high in saturated and trans fat, and 86 percent are too high in sodium. That’s alarming, according to CSPI, because a quarter of children between the ages of five and ten show early signs of heart disease, such as high LDL (the “bad” cholesterol) or elevated blood pressure.